Summer is coming but even in summer some places are covered in snow and ice. In the province Lapland in northern Sweden the Sarek national park located. It is one of most isolated places in Sweden. You won’t find marked trails here. It rains a lot in summer and snows in winter. So only well prepared hikers can go there. 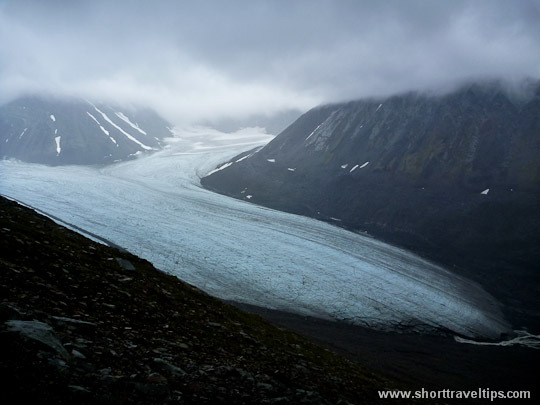 In the above picture – Mikkajekna glacier – one of the largest glaciers in the park. Wow! This place is breathtaking! I think it’s the same place where the Game of Thrones was filmed. I lived in Denmark for a stint and I well remember the Scandinavian “summers” (where snow could last well into mid-June!). It’s really interesting how a huge river could go completely frozen like that though it’s not that uncommon with an entire lake can be a complete ice. Amazing glacier! This looks so majestic I bet it looks even better in person.